Experience Chiropractic offers our patients the very best in high-quality, therapeutic massage therapy. This type of treatment is designed not just to provide pleasant sensations on the back and limbs, but to produce significant changes in soft tissue structure, circulation and muscle dysfunction. Hailing from Southern California, Paul’s massage experience includes working in both spa and clinical settings here in Chicago. No two sessions are the same, as Paul works with Dr. Jen and Dr. Kelly to create a unique treatment for you! 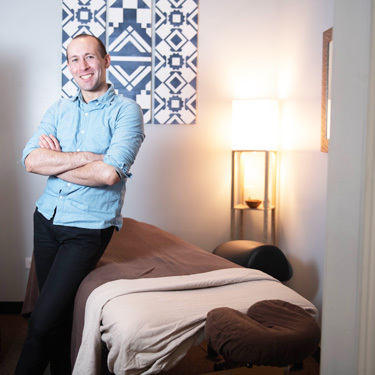 Paul enjoys employing traditional massage techniques along with assisted stretching, trigger point work, and myofascial techniques to address structural dysfunction. He has also recently been trained in silicone massage cupping to facilitate myofascial decompression. He’s looking very forward to working with the awesome Lincoln Park community! If you’re a part of our practice family, we may recommend what we call “doctor-dictated” massage therapy. This type of treatment means that we know what specific challenges you’re facing, and the kind of massage that would best suit your needs. Cupping : This ancient form of alternative medicine includes the use of cups that are placed on the skin for a few minutes. It may help alleviate pain, promote relaxation and improve blood flow. Deep tissue work : Though this type of massage is similar to Swedish massage, deeper pressure is applied. Deep tissue work is often used to break up scar tissue. It also can increase muscle mobility. Myofascial release : This hands-on technique uses gentle but sustained pressure to release tightness and relieve pain. It’s also effective in improving circulation and accelerating healing. Trigger point therapy : This type of massage uses direct pressure or stretching of the affected muscle. Trigger point therapy can help reduce muscle spasms and flush out pooled blood and accumulated toxins. If you’re not currently a patient, you’re still welcome to take advantage of our massage therapy services, which could also include Swedish massage. Please note that sometimes our massage therapy hours are different than the office hours dedicated to chiropractic treatments. Be assured, however, that your massage treatments will be as personalized as your chiropractic care; they also will be delivered with care and compassion. Discover the incredible healing benefits of massage. Contact our office today for a convenient appointment!